Researchers of University College London and the Engineering and Physical Sciences Research Council have developed a prototype window sample that is self-cleaning, energy-saving and anti-glare, the council reported. The window is ultra-resistant to water, so rain hitting the outside forms spherical droplets that roll over the surface, picking up dirt, dust and other contaminants and carrying them away. The 5- to 10-nanometer coating of vanadium dioxide, a cheap and abundant material, keeps thermal radiation from escaping when it’s cold outside and blocks the sun’s infrared radiation. The nanostructures also give the windows anti-reflective that reduces the light reflected internally to less than 5 percent, much better than the 20 percent to 30 percent found in other prototypes. This reduction in glare makes rooms more comfortable to occupants. Depending on the building’s latitude, the windows could reduce heating bills by 40 percent. 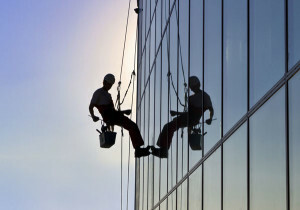 According to project leader Ioannis Papakonstantinou of UCL, the cost of cleaning a skyscraper’s windows in its first five years is the same as the cost of installation. By using this glass of course will cut the expenditure drastically.